David C. Weiss, United States Attorney for the District of Delaware, announced that on May 1, 2018, Omar Morales Colon (“Colon”), age 40, of Bear, Delaware, his wife Shakira Martinez (“Martinez”), age 39, and their company Zemi Property Management, Inc (“Zemi”) were charged by Superseding Indictment with numerous drug and money laundering offenses. Colon was originally indicted in June 2017 and charged with conspiring to distribute over 77 kilograms of cocaine and with possessing 175 marijuana plants that were found in an underground bunker beneath his house in Bear, Delaware. 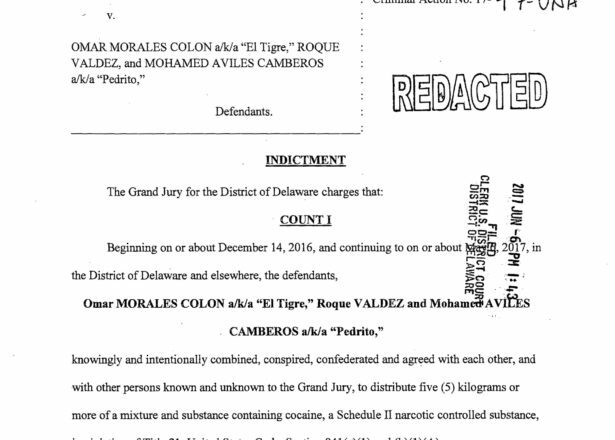 The Superseding Indictment alleges that from 2013 until 2017, Colon, Martinez, and Zemi conspired to conceal Colon’s drug proceeds by depositing large amounts of cash into bank accounts, purchasing cashier’s checks or soliciting third parties to do so, and then using those cashier’s checks to purchase numerous properties in Delaware and Pennsylvania. U.S. Attorney Weiss said, “While Colon already faced serious charges for distributing large amounts of drugs, this Superseding Indictment shows that the United States Government will not only look to incarcerate drug traffickers –we will endeavor to take their drug proceeds and dismantle their criminal organizations." The IRS and DEA Group 41 are the lead agencies investigating this case. DEA Group 41 is part of the New Castle County HIDTA, a collaborative effort established in January 2015 among federal, state, and local law enforcement agencies. This case would not have been possible without the substantial cooperation between DEA Group 41, New Castle County Police Department, Newark Police Department, Delaware State Police, Newport Police Department, Wilmington Police Department, University of Delaware Police Department, State of Delaware Department of Corrections Probation/Parole, Maryland State Police, Middletown Police Department, Delaware Alcohol and Tobacco Enforcement, Internal Revenue Service, and the U.S. Department of Homeland Security Investigations. DEA Task Force Officer Paul Lawrence, Special Agent Jeremy Smith, and IRS Special Agent Michael Pohar are the case agents. The case is being prosecuted by Assistant U.S. Attorneys Jennifer K. Welsh and Whitney Cloud, along with Special Assistant U.S. Attorney Barzi Axelrod from the Delaware Department of Justice.